When you need the muscle of an industrial printer, SATO’s M84Pro printer series is the one industry solution that customers around the world rely upon. Featuring its industrial full-metal construction the M84Pro has the strength to tackle the most demanding requirements on the shop floor, shipping dock, or any other harsh environment requiring dependable 24x7 operations. At its core is a design of proven durability and reliability found only in SATO printers. 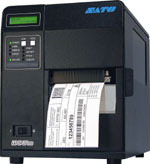 Powerful, industrial, reliable, dependable, the SATO M84Pro can be your greatest tool for strenuous mission-critical thermal printing applications.